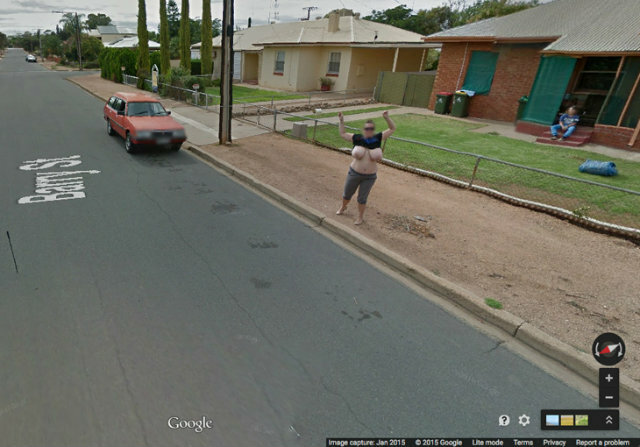 An Australian woman named Karen Davis achieved a small measure of digital immortality recently after she caught the elusive Google Street View car flashing pictures of her neighborhood, and, rather than cower in fear of the privacy-invading drone and all it represents, rose to the occasion and flashed it right back. Ms Davis has come forward to reveal the story behind her now infamous footpath “flash”. She was photographed with her breasts bare by Google’s Street View car in Barry Street where she pursued it for a short distance to ensure her image would be captured. “I look at Google Maps a lot and I wanted to be on there and I thought this is the way to do it,” Ms Davis said. “I also did it for a friend in the United Kingdom. Now he can see me all the time. “I got to tick something else off my bucket list. I met Sam Newman and now I am on Google Maps.” But the response has not been all positive with Ms Davis being criticised by social media, although she does not let it affect her. “Haters hate, you got the guts to do it?” she posted on Facebook after the photo went viral. “All the flat-tittie chicks think I am disgusting.